A new material has been developed by Japanese researchers, which has the ability to triple the capacity of lithium-ion batteries. Sumitomo Electric Industries has worked to set up a “small-scale production line” for producing such a material at its Osaka Works which is its R&D center. This project is named as “Aluminum-Celmet“. Aluminum-Celmet forms the base of a highly efficient battery in which the porosity power is up to 98 per cent. It essentially is the replacement for the aluminum foil anode in a secondary rechargeable lithium-ion battery. This porous characteristic of Aluminum-Celmet forms the basis for a huge volume of lithium compound that helps in the flow of electricity. This development by Sumitomo Electric is infact an outgrowth of its previous work on nickel and nickel-chromium materials which was tagged as Celmet generated from cell and metal. The way these are manufactured involves a high porosity conductive coating to form a foam made of plastic plated with nickel. 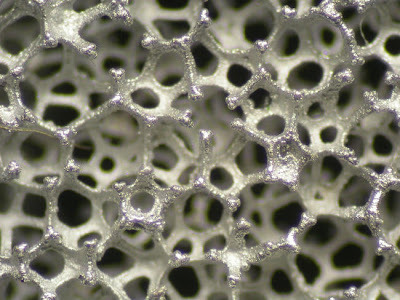 The foam is removed by heating the material which results into a 3-D mesh that is spherical in shape and has open pores. This can be easily processed by conventional methods which are cutting and attaching. Hence, Sumitomo Electric decided to use nickel-metal hydride and nickel-cadmium battery cells. However, the advantage of the new Aluminum-Celmet material lies in it being light and having an improvised electrical conductivity power which can easily avoid corrosion resistance. These are the exact qualities that makes it well-suited for secondary lithium-ion batteries. The firm has estimated that a lithium-ion automotive battery using Aluminum-Celmet will be able to provide one and a half times more power and a higher charging capacity of up to three times. It also seems to be an answer for improved capacitors seeking an aluminum capacitor having both positive and negative conductors by using a dielectric separator.